Rugby Borough are champions of the Everards Leicestershire Senior League Division One. They made sure of the title by beating Highfield Rangers 11-0 on Tuesday evening. The champions have an 11-point lead at the top of the table, with 77 points. Chasing Thurnby Rangers, who beat Rugby Borough 1-0 on Saturday, are second on 66 with three games still to play. Borough have two to complete their season, at Barrow Town on Saturday and Anstey Nomads Reserves on Wednesday. Having secured promotion earlier this month, next season Borough will be playing in the league’s Premier Division. 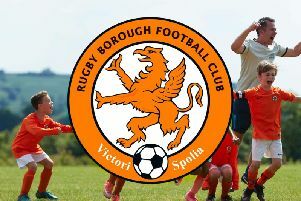 The day of the royal wedding also held importance for Rugby Borough, needing just a single point from this game to win the league title, Thurnby Rangers being the hosts. Jason Lee fired over from the edge of the box from a corner but none of the Rugby lads could reach his cross. Ashley Bodycote was then called twice to rush off his line to close on Thurnby’s strikers, saving both times. Ollie Chater then tested the home keeper from close range. Chater then fired a shot into the side netting and Connor Gamble struck a long shot with the Thurnby keeper saving well down to his right. From 0-0 at half time, the second half was much the same as the first. Chater curled a free-kick around the wall, which was well saved by the keeper, and Jack Blackham replaced Harley Matarutse. Thurnby then took the lead with a lob over Bodycote. Changes were made as Rugby Borough tried for the equaliser, but it never came.